With pension and healthcare liabilities mounting to unsustainable levels, the city of San Diego is considering filing for bankruptcy protection so that it may restructure its assets and liabilities. A civil service system that allowed retired city employees to collect generous pension benefits and apply for and receive pay from city jobs is part of what helped to create the current financial mess the city is in. See the following post from The Mess That Greenspan Made. Joe Mysak at Bloomberg files this report on how on e California city might extricate itself from pension and benefit obligations that it has no realistic chance of ever meeting. The city of San Diego should consider Chapter 9 municipal bankruptcy to help it reduce fringe benefits, pension and health obligations. More than two years of cutting budgets and the mounting public pension crisis have made the unthinkable an option, maybe even an attractive one. 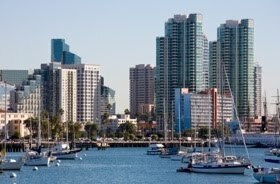 Having lived in Southern California for many years, there were many stories to be heard about how you could get rich working for the City of San Diego and, apparently, a lot of people did. Double-dipping was common. Not the recession double-dip you hear so much about today, but the widely practiced “retire and then get rehired” career move where individuals collected both a retirement check and a regular paycheck while still in their 50s. It’s not hard to understand why they now have such a mess on their hands. so.... what are the other 4 cities declaring bankruptcy? However, on a quick skim I only saw Orange County and Vallejo.